The Back-And-Forth robot is slightly more complicated to put together than meets the eye. For example, one wouldn’t initially suspect that ShapeLock plastic and a table saw were needed to attach the Lego wheels. Drilling holes in small blue solderless breadboard. Starting at the top, the attractive blue solderless breadboard needs screw holes to hold it onto the base plate, as well as holes going straight through the entire body for the motor and switch wires. At this point, my mistake was choosing a base plate material based on the color matching the breadboard. I selected blue “premium” UHMW. 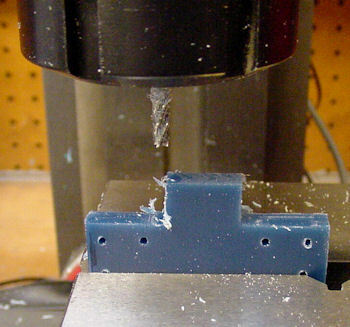 It cuts almost as badly as the low-temperature prototype plastic, without the benefits. 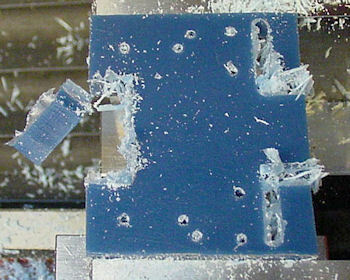 Screw holes drilled in blue UHMW plastic need razor blade scraping. 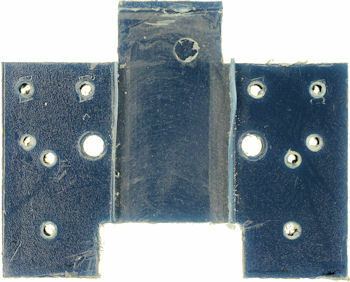 The base plate has approximately a dozen holes; most of them threaded for screws. Each hole required delicate scraping to remove residual material. 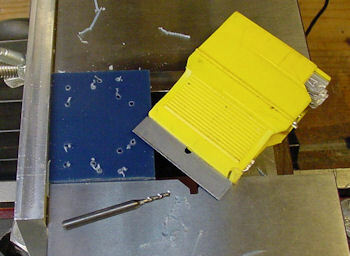 Rough machining wheel slots in base plate. The wheel-well slots turned out almost as ugly. Lots of “stringy burrs”. Final machining of wheel slots in base plate. Flipping the piece upright to finish and square the slots cleaned it up a lot. Nearly finished base plate made from premium UHMW plastic. Ugh. You can just sense how uncooperative this plastic is from the messy and uneven base plate in the above photo. The sides of the motor slot (in the middle) were already cleaned up with my wife’s best sewing scissors. Seriously, when your finest semi-professional machining skills and equipment give way to domestic tailoring tools, it is time to switch materials. Despite these complaints, after drilling a couple of additional holes to mount the motor, the base plate really brings the robot together. Completed one-chip back and forth robot. The electronics snap into the solderless breadboard. The solderless breadboard screws onto the base plate. 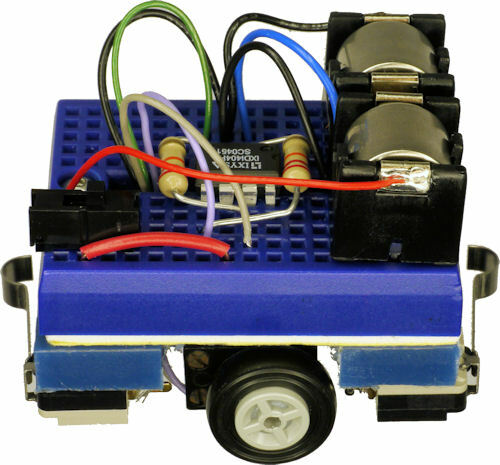 The motor, wheels, and switches also screw onto the base plate. One of the most satisfying aspects of learning to machine your own parts is that you don’t need to rely on glue, tape, or anything flimsy to connect your robot. Sure, I used a little bit of transparent tape to hold the motor wires in place, but that’s an appropriate use. When the robot runs, I don’t have to worry about it falling apart, even if the robot runs into walls. When the robot isn’t running for some reason, I can disassemble it by unscrewing parts, and reassemble it quickly after maintenance. However, if you’re a beginner, don’t let the machining dissuade you. This is an easy circuit to build on a solderless breadboard. If the remainder of your robot is cardboard, tape, and bubblegum, it will still be that much better and enjoyable than never having built anything. Go for it!